Cilantro lime shrimp tacos EXPLODING with tangy, punchy flavor complimented by sweet refreshing Mango Salsa and silky Avocado Crema! Cilantro Lime Shrimp Tacos are the BEST light, flavorful and fillings shrimp tacos that rival any restaurant and on your table in 30 minutes! You can prep the toppings ahead of time for a super quick and easy weeknight dinner that tastes wonderfully gourmet. Add all of the Shrimp Ingredients (except the “Add Later” ingredients) to a bowl and stir to combine. Let sit 15-30 minutes at room temperature. You can use this time to prepare your Mango Salsa and Avocado Crema. Instructions Below. 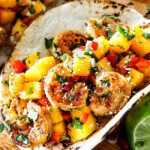 Add all of the Mango Salsa ingredients to a medium bowl and stir to combine. Refrigerate. Add all the Crema ingredients to your blender and blend until smooth, scraping sides down as needed. May make 4 hours ahead of time and refrigerate in an airtight container. Add shrimp followed by Mango Salsa, Cotija Cheese then Avocado Crema. Add additional lime juice and hot sauce if desired.